Dogs get old in the same way humans do and many of the ailments of old age are the same. Dogs of course have a much shorter lifespan and as an owner the onset of old age in your dog can come as a shock. 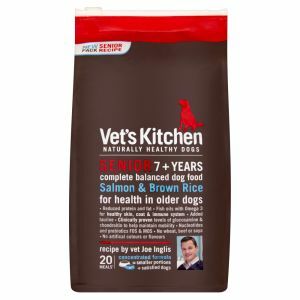 As the man behind Vet’s Kitchen Pet Foods, TV vet Joe Inglis, wrote in his own article on senior dogs “one day he’s a lively puppy and then all of a sudden he’s got a grey muzzle and arthritic legs”. In the same way that as you get old you take extra care of yourself and what you eat you can keep your dog active and sprightly for longer and potentially avoid some of the most debilitating problems, such as joint pain and digestive problems, altogether. When should you start considering your dog as old aged or ageing though? The accepted and simple rule of thumb that seven dog years are equal to one human year isn’t quite right it seems and the breed of the dog makes a big difference. In general larger breed dogs live for less years than a smaller dog and so reach old age more quickly. The guide below is based on a guide from vet Joe Inglis, this is still only a vague guide though and some breeds, such as Bloodhounds, sadly have particularly short lifespans. For small dogs (up to 10kg) – you should calculate 12 human years per year for the first two years, making a small two year old dog 24, and then 4 per year thereafter. This means a 10 year old terrier will be 56 and a 15 year old 76. For medium dogs (10-30kg) – 10 human years per dog year for the first two years, and then 5 per year afterwards. This means a 10 year old spaniel, will be 60 years old and a 15 year old will be 85. For big dogs (30kg +) – Calculations are simpler at least: 8 human years per dog year throughout. A German Shepherd at 8 will be around 64 in human years and will have similar signs of age to a 64 year old human. Diet is vital for older dogs and you may find that an older dog will go off the food they have loved for years anyway. For a start mature dogs need less protein and less fat, they are no longer growing or developing strength and their digestive system can’t break it down as well and their kidneys may be put under strain. While high protein content dog foods should be avoided aging dogs do still need some protein, a protein content of around 18-24% being about right depending on their exact age and their breed. The protein in Chicken and Fish is easier to digest and most senior foods, including that from Vet’s Kitchen, avoid Beef and other red meats. More fibre can also help keep your Senior Dog’s digestion healthy and Vet’s Kitchen Senior includes Salmon as a protein source and Brown Rice as a source of fibre as the main ingredients. Senior dogs need less energy as well-meaning overall they will probably eat less. If they don’t cut their calorie intake though they can quickly put on weight due to being less active and you then have a vicious circle where excess weight causes them to become even more lethargic and in time this can lead to joint problems. skin, coat and the immune system, and taurine that keeps the heart strong. Prebiotics in dog food help keep your dog’s gut healthy meaning that they are less likely to become sensitive or allergic to certain foods. Joe Inglis himself and it is designed as a complete balanced food with these extra benefits coming from natural ingredients, including Salmon Oil for extra Omega 3 Fatty Acids, keeping your older dog fit and healthy. This entry was posted in Dogs and tagged senior complete dog food, senior dog food, senior dry dog food, senior salmon and brown rice, vet's kitchen, vet's kitchen senior, vet's kitchen senior salmon and brown rice by zooplusuk. Bookmark the permalink. My dogs, ( german shepherd & border collie) can actually eat this without getting stomach upsets & are happy to eat it too. I normally stick to Origen as it’s the only dry food I can feed on a regular basis without issues. I’ve stocked up on Vets Kitchen now & am so happy I have two foods I can alternate now as this is cheaper. It’s difficult finding good food for German shepherds as their stomachs are weak & react quickly. Thank you Zooplus for stocking Vets Kitchen on your site. A wonderful job. Super helpful infomrtaion.